Ok, so I truly 100% believe that SUGAR is an addictive substance. It's a powdery white substance that goes into your body and once it is in your bloodstream, you just crave MORE AND MORE AND MORE. It's a vicious cycle - and what is so aweful is that - unlike illegal drugs, sugar is SO widely accepted - and not only "accepted" but even FORCED upon us sometimes WITHOUT our knowledge!! Valentine's day, for example - my fiance and I went out with his family to Bucca Di Beppo (yes, that was hard enough, being an italian/pasta place!) - and EVERYONE ordered the Red Velvet Cake at the end of the meal. I didn't touch it at all - even with everyone saying "oh, c'mon - just one bite!" nope - didn't do it! Now - admittedly - on the day of my 30th birthday party, I DID "endulge" (ok, yeah, I binged) on red velvet cake (did I mention this is my favorite? lol) and brownies and cookies, etc. etc. 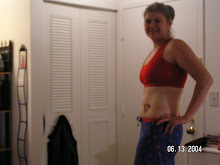 After the party, though, I got RIGHT back on track and lost the weight I'd gained during that binge. And everyone knows that halloween was this past weekend. I bought candy I thought I wouldn't mow down on...wellllll - yeah. We had some left over and so in the past few days I've had at least ten mini snickers bars! ACK! I'm not perfect and I know that - but it pisses me off that it's SO incredibly easy to just fall back into the habit like that! Today - I actually decided to REALLY start journaling. I'm not doing it on here and probably won't share - but I'm keeping an actual JOURNAL that will also keep track of how I sleep at night (this is the main reason) as lately I've really been trying to figure out how to get my insomnia under control. Some nights I sleep GREAT while other nights are aweful. Last night, for example - I took two 3mg pills of melatonin and I actually think I slept pretty well. I fell asleep around 11 last night and don't remember waking up til around 5! that's HUGE for me. but the funny thing is - I ate three snickers last night alone! So I'm just really curious to really document and figure out my sleep patterns - what I ate the day before - as well as my mood patterns...another thing is while I have horrible sleep at night - there are some days when, while driving home from work - I SERIOUSLY feel like falling asleep at the wheel! That has been going on for at LEAST 10 years! I'm still trying to figure out if maybe I'm deficiant in an amino acid or not. I'm sure I'll blog about some of my findings. Later! Red Velvet is my favorite also...its soo good!